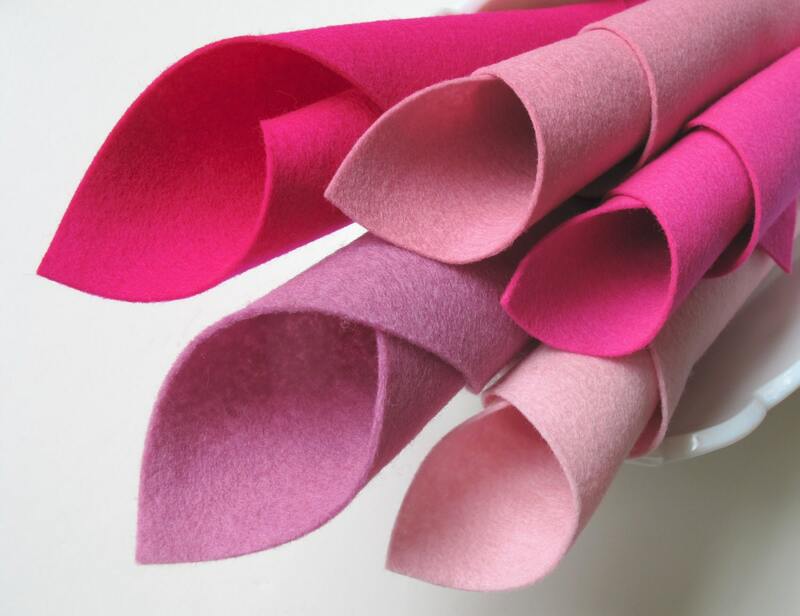 Pretty Pinks - 100% merino wool felt. Set of five wool felt sheets. Each sheet measures 20 x 30cm, which is approximately 8 x 12". The wool felt is 1mm thick (1/16th inch). Sheets are cut by hand and may vary slightly in size. Tickled Pink Shades include: Baby Pink, Cerise, Deep Pink, Lavender Pink and Rose Pink. This wool felt is free from nasty toxins and chemicals making it perfect for craft projects where only the best wool felt will do. Certified child-safe and ideal for Waldorf projects, needlework, children’s items and so many more creative uses. My wool felt is color fast, beautifully soft and fade resistant so you are safe in the knowledge that your crafts will stay looking as beautiful as when you first made them and are worthy of the phrase ‘heirloom quality’. *THIS* is the good stuff! Pure, 100% merino wool felt specifically created for sewing and hand-crafting. Don't confuse this pure fabulous felt with a wool-blend felt. There's a whole world of difference between the two. The term 'wool felt' is often used loosely. Some 'wool felts' contain as little as 10% wool - the remaining fiber being acrylic, rayon or viscose. If you're looking for REAL wool felt, you've come to the right place. This is pure, 100% wool felt. Please note: I take great care in photographing my wool felt in natural light to accurately show the colors as 'true' as I can. However.... computer monitors, smart phones and tablets can make colors appear different than they really are. Really happy with my purchases from this shop! I ordered a variety of felt colors and they are all vibrant and just what I wanted. The quality is lovely. Highly recommended! Beautiful felt. Looking forward to starting my project.